Do you know how some people like to sit around and people watch...well, I'm a grocery cart watcher. It always amazes me what people purchase at the grocery store. For the most part American's eat incredibly unhealthy and you can see it by standing in the checkout line of any grocery store. I think I actually shocked the checker when I placed my ingredients on the conveyor belt because he commented that I must eat really healthy and he wished that he did more often. And here I am walking around the store stressing about my Ciabatta bread purchase because it wasn't sprouted whole grain! Anyway, the rest of the ingredients (cannellini beans, tomatoes, broccolini and arugula) make up for the fact that I used white bread. 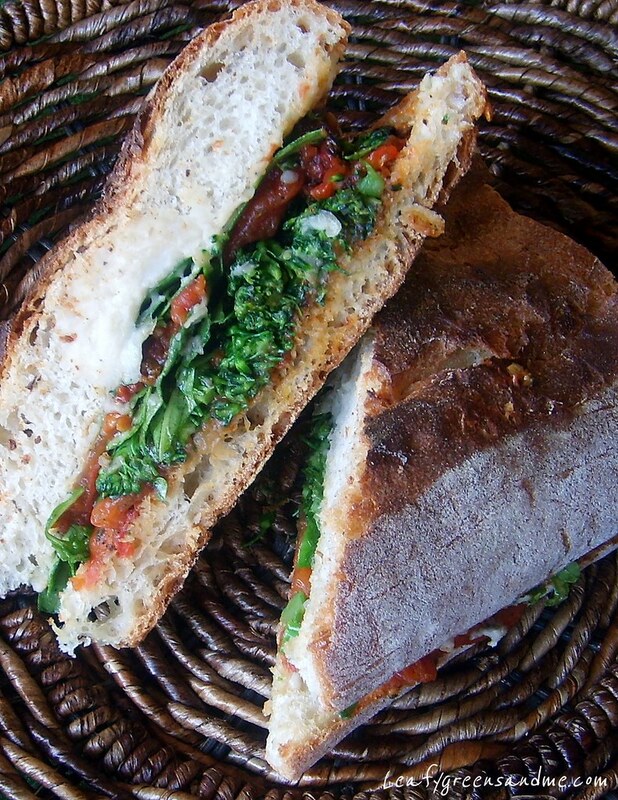 Because you can't make an authentic Italian sandwich without Ciabatta! In a large bowl, toss tomatoes with garlic, herbs, salt and pepper. Place tomatoes on a baking rack positioned over a sheet tray and roast for about 1-1/2 hours until lightly charred and most juices are absorbed. Remove from the oven and let cool for about 15 minutes before removing skin. Slice into 1/4" strips, set aside. In a small saute pan over low heat, add olive oil, garlic, herbs and saute for about 3-4 minutes until garlic is soft. Be careful not to let the garlic brown, stirring constantly. Place cooked cannellini beans in a bowl, and mash with a fork or potato masher. I used a pastry cutter. You want the beans to have some texture. Stir in olive oil mixture, lemon jest, lemon juice and salt and pepper to taste. Chill for about an hour for flavors to combine. Fill a medium sauce pan with filtered water, add 1 tbsp kosher salt and bring to a rapid boil. Add broccolini and cook for about 1 minute, remove and place in an ice bath to set color. Drain and dry on a paper towel. Heat a saute pan on medium heat, add crushed red pepper flakes, broccolini stalks, garlic, salt and pepper and saute for about 3-4 minutes until crisp-tender. Remove from pan and place on a cutting board and roughly chop, set aside. 1/2 cup balsamic vinaigrette (1/2 tsp minced garlic, 1/4 tsp minced shallot, 1 tsp Dijon mustard, 1 tbsp agave syrup, 1/4 cup balsamic vinegar, 1/2 cup extra virgin olive oil and kosher salt and black pepper to taste. Cut ciabatta in half and toast for a couple of minutes in the oven or in a toaster oven. Drizzle both sides with a little vinaigrette and place the cannellini bean spread on both sides. Add the sliced roasted tomatoes to one side of the bread. Toss the broccolini and arugula with a little balsamic vinaigrette and add to the other side. Finish with a squeeze of fresh lemon juice and more crushed red pepper flakes if desired.